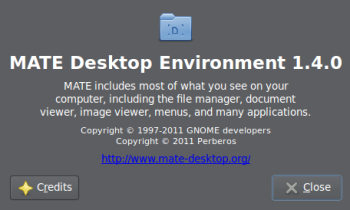 Fans of Linux in general and Linux Mint in particular are no doubt already familiar with MATE, the GNOME 2-like desktop that was first included in Linux Mint 12 as an alternative for users wary of GNOME 3. MATE is still less than a year old, but on Monday the open source project behind it announced a brand-new update. With packages available for Debian, Ubuntu, Fedora, and other Linux distributions as well, MATE 1.4 includes numerous bug fixes and several key new features. Ready for a quick rundown? Here's what you can expect to see. MATE is, of course, a fork of the old but popular GNOME 2 desktop, and when it was created, numerous key GNOME applications were forked and renamed as well. Instead of the Nautilus file manager, for instance, MATE includes Caja; instead of the GNOME terminal, there's the MATE terminal. Several improvements were made to Caja in this latest release, in fact, including restoring the toggle button for the text-based location bar; a new button to show the difference between files in the file conflict dialog; and the ability to open bookmarks in the places side pane using the enter and space keys. A Caja dropbox package is also now available. Another significant new feature in MATE 1.4 is that file sharing is now available via Bluetooth, the project team says. Several new themes and a MATE character map have also been added to the new desktop, which incorporates a raft of bug fixes and other improvements as well. Do you pine for the old days of the GNOME 2 desktop? Just yesterday I wrote about another option to consider: the forthcoming SolusOS 2 Linux distribution, which will incorporate a custom GNOME Classic interface that also mimics GNOME 2. Meanwhile, you can check out MATE 1.4 right now by downloading it for free from the project site.